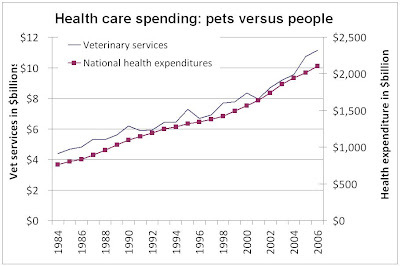 This chart from Andrew Biggs "shows spending on veterinary care, which I pulled from the Consumer Expenditure Survey, and national health expenditures (for people) from the National Income and Product Accounts.... the rate of growth of spending from 1984 to 2006 wasn’t all that different—and in both cases, spending grew faster than the rate of economic growth. As new technologies are developed for humans, we adopt them for Bowser and Fifi—because we can afford to and we think it’s worth it." These data are consistent with what I wrote a couple years ago: "The reason that we spend more [on healthcare] than our grandparents did is not waste, fraud and abuse, b ut advances in medical technology and growth in incomes. Science has consistently found new ways to extend and improve our lives. Wonderful as they are, they do not come cheap. Fortunately, our incomes are growing, and it makes sense to spend this growing prosperity on better health." 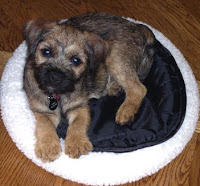 And that includes Tobin, the Mankiw family pet, pictured here.